The Lord of the Rings By J.R.R. 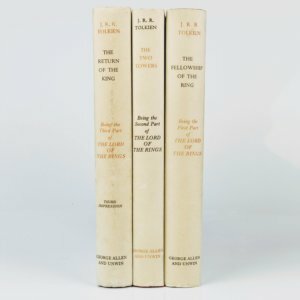 Tolkien A complete set of first impressions of the second edition (George Allen & Unwin, 1966). The Fellowship of the Ring - Top edge stained red. Cup mark to upper board; rubbing to bottom edge, hinges and corners; foxing to fore-edge with previous owner inscription to front endpaper. Fold-out map is still present. The original and unclipped jacket has some rubbing here and there to extremities; small nick to top edge of rear panel; marginal toning/staining to rear panel; spine panel a little toned with scuff mark a third of the way down; toning to spine panel verso. The Two Towers - Top edge stained red; spotting to upper and lower boards; slight spine slant; a little rubbing to corners and bottom edge. Fold-out map at rear still present. Original and unclipped jacket has a small hole to bottom of hinge on front panel with minor wear to extremities. The Return of the King - Top edge stained red; edges and corners rubbed; slight spine slant with some discolouration to lower board. Fold-out map at rear still present. Light rubbing to extremities of original and unclipped dust jacket; crease and small nick to bottom edge of rear panel; one or two marks to rear panel. A very good set indeed. 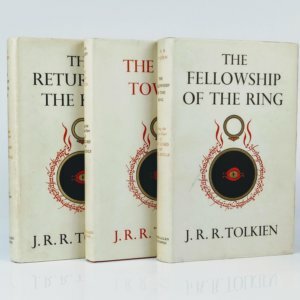 A complete set of first editions of The Lord of the Rings Trilogy. 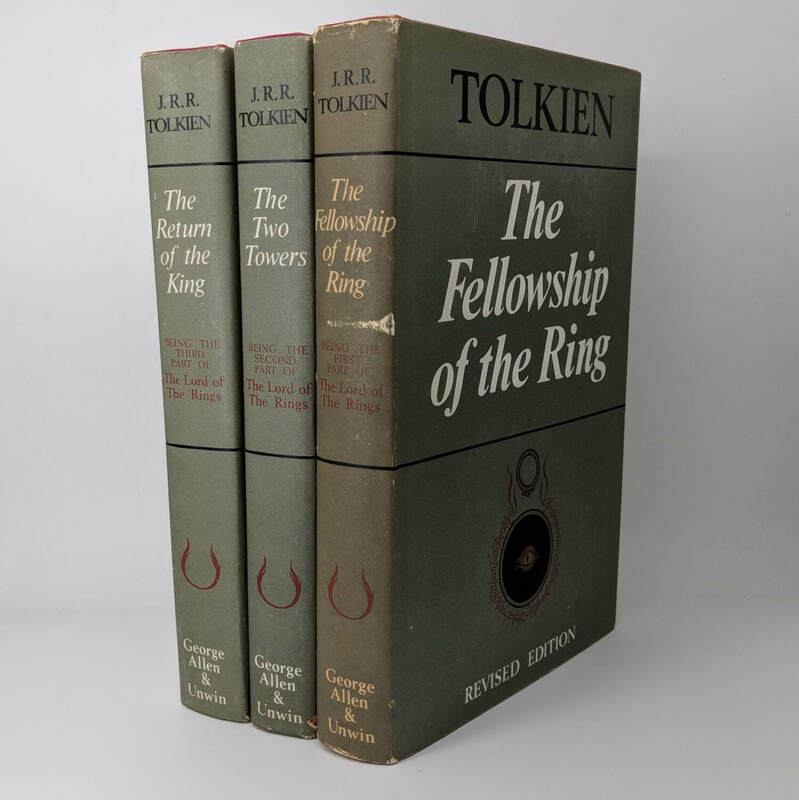 The Fellowship of the Ring: First edition, fifth impression (George Allen and Unwin, 1956) in sixth impression dust jacket. Originally published just over two years earlier in July 1954. A little pushing to spine tips; offsetting to endpapers with light spotting to fore-edge. Boards nice and clean, rear map still intact and red top-stain bright and nicely preserved - near fine. The dust jacket is not price-clipped and has nice and clean spine panel with barely any toning; extremities a little rubbed in places; blue mark to upper panel. Near fine overall. The Two Towers: First edition, fourth impression (George Allen and Unwin, 1956) in third impression dust jacket. Originally published two years earlier in 1954. Some pushing to spine foot; offsetting to endpapers with a superficial scratch to lower board and faint spotting to fore-edge; rear map still intact; red top-stain just a little darkened with a small patch of light fading, but still nicely preserved. The dust jacket is not price-clipped and is very clean and well-preserved. Barely any toning to spine panel with a little and very occasional rubbing to extremities; very small closed tear to top edge of upper panel. Near fine overall. 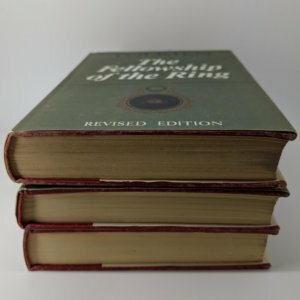 The Return of the King: First edition, first impression (George Allen and Unwin, 1955) in third impression dust jacket. Light offsetting to endpapers; a bit of rolling to spine foot with occasional and faint spotting to fore-edge. Near fine. The dust jacket is not price-clipped with some edge wear, primarily to the top; spine panel just a little toned and rubbed to extremities; small closed tear to lower panel. Very good or a little better. A complete and beautifully preserved and clean set.